100 m a s s a g e & b o d y w o r k m a y / j u n e 2 0 1 8 technique THE SOMATIC EDGE Is Your Work Valuable? By Til Luchau Beauty, they say, is in the eye of the beholder. In other words, not everyone thinks the same things are attractive. "Value" is similar: the worth we assign something (for example, the price we're willing to pay for it, or how much effort we'll put into getting it), varies from person to person and from situation to situation. This perception of value can help (or hinder) your hands-on work in more ways than might first meet the eye, and it pays to be interested in how the value of your work is perceived. The idea of value gets even more interesting in value exchanges, such as a client paying you for a session. In this case, the overall value of that session is now in the eyes of at least two beholders—you and your client, each with your own perspectives about its worth. These two views influence each other: if you know your client doesn't think your session was very good, your own sense of its value likely goes down. Most importantly, this is also true the other way around: if you don't value what you offer, chances are very good that your client won't think it's worth much either. And then there are results—the benefits or changes your clients attribute to your work. Results have a complex, two-way interrelationship with value. It might seem obvious that the results your clients get would determine whether your work seemed valuable to them. If your clients feel better, have less pain, or are less stressed after your work, they're more likely to think it was worth their investment. But, like many chicken-and-egg relationships, if your clients have doubts about the value of your work to begin with, the results they want will be much harder to get. And, if (for whatever reason) clients are predisposed to think that their sessions' results will be good, they're much more likely to get real benefit and satisfaction. 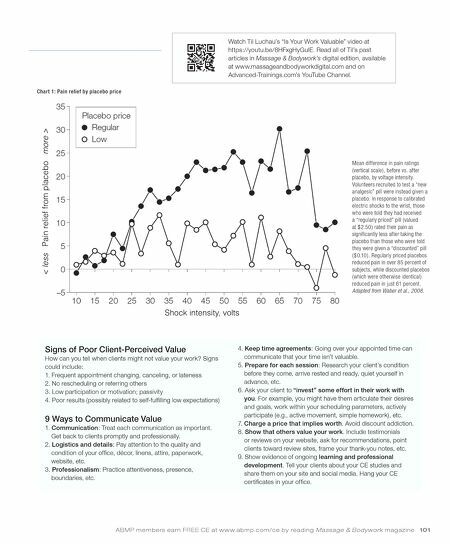 WHAT INFLUENCES VALUE Placebo research reveals that, among other things, price can play a key role in self-fulfilling expectations of effective results (Chart 1). 1 And, as many practitioners' discounting or Groupon experiments have shown, discount-motivated customers are much less likely to become regular customers, or to refer others. 2 But price is just one measure of perceived value, and not a very reliable one, since incomes and attitudes about money vary widely. Your work does not have to be expensive to be well-appreciated and effective. Results, effectiveness, and price are just some of the many things that influence your clients' perception of value. Other important factors include: • whether they enjoy their visits • the rapport and trust they feel with you • the authority or credibility you have in their eyes • whether they see what you offer as something special Clients take some of their strongest value cues from you, their practitioner. If they see that you value what you offer, they're much more likely to see it as worthwhile too. If you have doubts about your abilities or methods, those would be the first things to get help with (see "The Value of Confidence," Massage & Bodywork, March/April 2018, page 102). But if you already believe in the value of your work, there are many ways to communicate this (see "Signs of Poor Client-Perceived Value" on page 101).